By its very nature, most of digital learning is related directly to digital networks. When education moves into digital environments, we find ourselves located differently. In some cases — as with learning inside a learning management system (LMS) — the move is slight: we find ourselves interacting inside a closed environment with a small group of students, all of whom have relatively the same context for the learning. But in other cases — as with professional and scholarly networks on social media like Twitter — the move can be so exaggerated as to cause disorientation, where we find ourselves interacting with an unknown number of participants coming and going from a multitude of contexts. Digital learning can move quickly from feeling like a traditional classroom to teeming like an international airport. 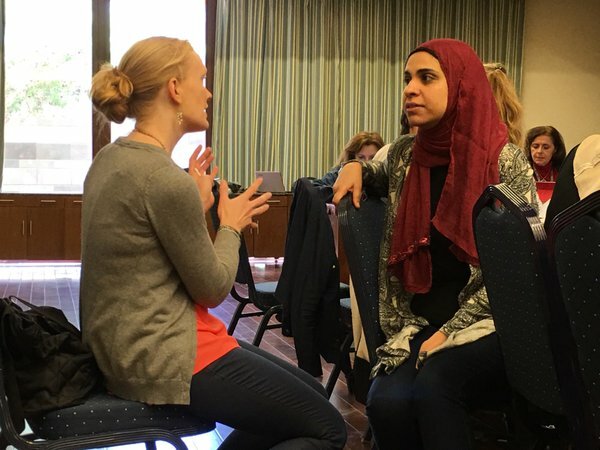 From March 20-22, Amy Collier and Sean Michael Morris from the Office of Digital Learning helped to host the first international Digital Pedagogy Lab Institute at the American University in Cairo, Egypt. As facilitators of the Praxis track, Amy and Sean led workshops about digital pedagogy, assessment, the LMS, creating digital assignments, using a variety of digital tools, and writing teaching statements that incorporate digital pedagogy. Their students included teachers, administrators, and technologists from Lebanon, Sharjah, Kosovo, Pakistan, Russia, Greece, France, and Italy, and from fields including library science and information systems, the humanities, STEM, and more. Both Sean and Amy also delivered keynote presentations during the event. The Institute was the second of its kind created by Digital Pedagogy Lab, a 501(c)3 non-profit committed to delivering professional development in digital pedagogy online and on-ground. As part of the wide scholarly network located inside and around Digital Pedagogy Lab, Amy and Sean were able to use the event to establish connections with other digital scholars around the world, and to exemplify the kind of support and instruction available through the Office of Digital Learning. Because of its networked nature, digital learning cannot be contained at a single institution; instead, collaborations across institutions, across disciplines, and across media allow digital learning to expand and create greater opportunities for the teachers, students, technologists, librarians, and administrators at Middlebury and beyond. Entering the fray at events like Digital Pedagogy Lab will help us all open up new conversations about how learning happens in the digital age. For more information about the event, follow the links embedded here, watch Amy Collier’s keynote presentation, or visit the Digital Pedagogy Lab – Cairo web site.